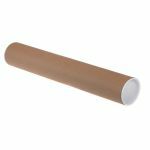 Our cardboard tubes for posting prints and paper of up to A0 size; (1189 x 841mm or 46.8 x33.1 ins) give reliable and durable protection so that your documents will arrive safe and undamaged. Useful for mailing any cylindrical object, our postal tubes are quick and easy to use. You just roll up your documents such as maps, posters and calendars, insert them in the packaging tube and snap on the end caps to secure the contents. Manufactured from strong recycled cardboard, our postal tubes are lightweight, saving you postage, and economical because they are sturdy enough to be reused. Our cardboard postal tubes will secure your rolled plans or posters, for example, safeguarding them from damage during shipping or storage. End caps, specifically designed to slot perfectly into the packaging tubes, keep the contents in place while helping protect your A0-sized documents from dirt and dust as well. For extra security, you can stick an adhesive tape on the end caps of the mailing tube. Made from rigid cardboard, which is recycled and recyclable, our economical A0 sized cardboard postal tubes are available in 2 diameters, both giving your documents a presentable packaging. They are essential in offices and schools for packing or archiving documents like charts, maps, posters, blueprints and drawings without creases or folds. Supplied in a pack of 10, the A0 postal tubes speed up packing significantly as you simply insert the rolled paper inside the tube, close the end caps and it’s ready to be shipped or stored.